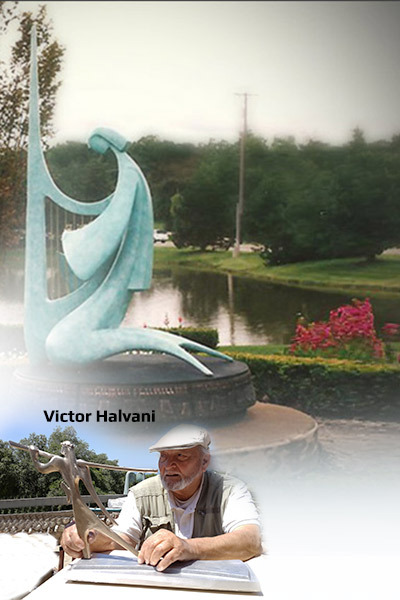 2013 – Ein Hod, Yemini sculpture garden, at main entrance to artist’s colony, sculpture exhibited “David playing the harp”. 2012 – Opening of “Art exhibit- Victor Halvani”. At the Halvani residence in Ein Hod, exhibits large collection of sculptures and prints. Visits by appointment. 2011 – Safed, “The Shofar” art project, exhibited at “Safed liberation square”, at main entrance to the city, in the presence of the mayor and representatives of U.S. donors. 2010 – Safed, “The Spies” art project placed, and square named Halvani, at southern entrance to the city of Safed, in presence of the Mayor, Ilan Shochet, and representatives of U.S. donors. 2001 – Participation in international exhibit in San Francisco, U.S.
2001 – Katzrin, Ramat Hagolan, Exhibit of sculptures “Mother playing with child”, “Hope for peace”, and “David with slingshot”, around the city. 2000 – New York, U.S. – International millennium art expo – exhibited “The Hope”. 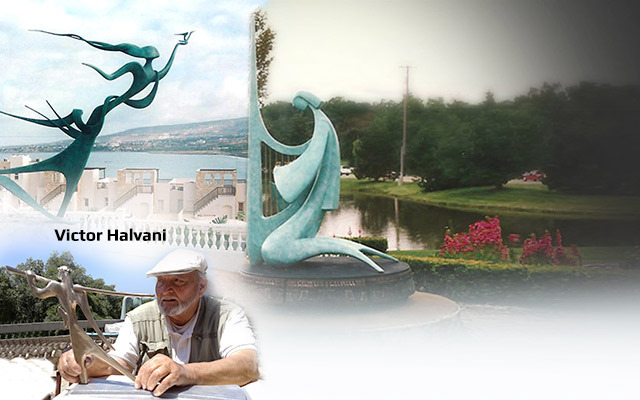 1999 – Safed, completion of phase 2 of Victor Halvani sculpture garden in Oranim neighborhood. 1998 – Bennington, U.S. – Solo exhibit with collection of bronze sculptures at Bennington art center. 1997 – Stillwater, Oklahoma, U.S. – Placement of sculpture “David playing the harp” at the entrance to Seretean art center at the University of Oklahoma. 1996 – Miami, Florida, U.S., Center for international exhibits – solo exhibit, selection of bronze sculptures. 1995 – West Bloomfield, Michigan, U.S. – Placement of sculpture “David playing harp” at the Reform Jewish Cultural Center park. 1995 – Boston, U.S. – placement of sculpture “David playing harp” at Stanley & Barbara Young Park at Northeastern University. 1994 – Safed, at artist’s museum garden (general exhibit), exhibit of sculpture “Adam and Eve”. 1992 – Safed, placing of 3 sculpted monuments around the city – “David with slingshot”, “Mother playing with child”, “The Deer”. 1990 – Detroit, Detroit art center, Solo exhibit. 1990 – Safed, establishment of Victor Halvani sculpture park in the outskirts of the city, placement of sculpture project “The binding of Isaac”, 7 sculptures which together form a sculptured story. In addition to other sculptures such as “Trojan horse”, “Miryam with drum”, “Space age family”, “The Hope for peace”, “Ruth and Naomi”. 1989 – New York, West Palm Beach, Miami Beach, Coconut Grove- solo exhibit tour exhibiting a selection of bronze sculptures. 1989 – Safed, Beit Yigal Alon plaza, construction and placement of sculpture project “Fire Vehicle”, which won a prize from the Ministry of construction and housing. 1987 – Las Vegas convention center – solo exhibit. 1986 – New York, U.S. – exhibit of sculpture project “Jacob’s Dream” at main entrance to Jacob Javits center and official opening of Art Expo New York. 1985 – Tokyo, Japan – solo exhibit at Museum of modern art – La Forat building. 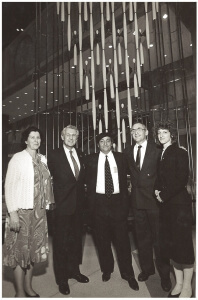 1985 – Toronto, Canada – Toronto convention center, solo exhibit. 1984 – New York, U.S. – Art Expo New York. 1980 – Safed, Artist’s colony, opening of Halvani gallery in the artist colony with collection of sculptures from various periods. 1975 – Jerusalem, participation in exhibit for sculpture in unconventional materials. Displayed sculptures “A look at birds in flight”, made of compressed Polyurethane, and artwork “Statue in tension of materials” made of Plexiglas and aluminum. 1974 – Hadera, Municipal library – placement of monument “Peace Doves”, 3.6 meters high 9 meters long, Iron. 1973 – Caesarea – sculpture “Two Figures” displayed in art gallery. 1972 – Caesarea – sculpture “Adam and Eve” displayed in art gallery. 1970 – London, England – “Peace Dove” sculpture displayed at his graduation at Hammersmith College of Art and Building exhibit. 1962 – Chibat Zion – Monument ‘Yad Vashem” erected in memory of holocaust victims. 1961 – Paris, biennale young artist exhibit, “The Deer” was chosen to represent Israeli artists at the exhibit. 1959 – Haifa, “Mothers” sculpture is chosen for “Sculpture and Garden” exhibit which brought together the best Israeli artists in the 1950’s. The sculpture was sold and displayed at the municipal hospital in Wilhelmshaven, Germany. 1958 – Tel Aviv, Elcharizi artists’ house. “Flamingo” sculpture made of plaster and iron displayed. The sculpture was cast in bronze and is displayed at the artist’s exhibit in Ein Hod.